NICCONI (AUS) (Bay 2005-Stud 2010). 6 wins-1 at 2, VRC Lightning S., Gr.1. 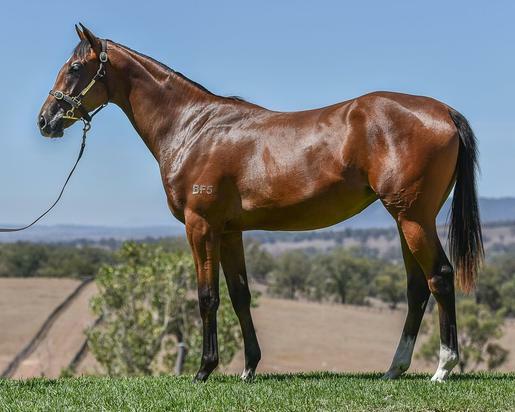 Sire of 328 rnrs, 230 wnrs, 15 SW, inc. Faatinah (SAJC Euclase S., Gr.2), Sircconi, Chill Party, Nicoscene, Time Awaits, Concealer, Hear the Chant, Niccanova, State Solicitor, Caipirinha, It's Been a Battle, Ayers Rock, Quatronic, Exclusive Lass, Loved Up, SP Shokora, Fickle Folly, Bolero King, Nieta, Caesour's Dream, Niccolance, Akkadian and of First Class Miss, etc. Couldn't Agreemore (g. by Not a Single Doubt). 6 wins to 1300m, A$219,635, SAJC Hyland Race Colours H., Tattsbet H., VRC Dean Palmby & Scott Millson H., 2d SAJC HC Nitschke S., L, MRC Pink Ribbon Cup, SAJC Junction Cup Lunch 2YO P., Audi Solitaire H., Schweppes H., 3d VRC Bob Hoysted H., L, 3AW Community Raceday H.
One Short (g. by Snippetson). 4 wins-1 at 2-to 1400m, A$156,060, to 2017-18, WATC Amelia Park H., 2d WATC LWP Property Group P., $5 Early Bird Admission P., Fujitsu Ducted Air H., 3d WATC Jim Chadwick 80th Birthday 2YO P.
First Among Equals. 5 wins at 1000m, 1400m, HK$4,330,050, HKJC Lek Yuen H., River Verdon H., John Peel H., Sichuan H., Chevalier Construction H., 2d Hong Kong Racehorse Owners Association Trophy-twice, HKJC Lung Kong H., Peak H., Chevalier Construction H., 3d HKJC Clear Water Bay H., 3D Gold Cup H., North Point H., Heilongjiang H.
DARREL (Distant Relative). 17 wins-2 at 2-from 1400m to 2800m, €299,318, 49,894,934L., Rome Premio Roma Vecchia, L, Premio Foro Italico, Premio Right Bank, Premio Tullio Mei, Handicap d'Autunno, Naples Premio Melbourne, Rome Premio Adelaide Adams, Premio Federippodromi, Premio Steel Pulse, 2d Rome Premio Carlo d'Alessio, Gr.2, Florence Corsa dell'Arno, Rome Premio Foro Italico, Premio Diacono. MIDNIGHT LUTE (Real Quiet). Champion Sprinter in USA in 2007. 6 wins-1 at 2-at 6f, 7f, US$2,690,600, Breeders' Cup Sprint S., Gr.1-twice, Saratoga Forego S., Gr.1, Keeneland Perryville S., Gr.3, 1400m-in track record time, Del Mar Allowance, 2d Aqueduct Cigar Mile H., Gr.1, Santa Anita San Fernando S., Gr.2, 3d Santa Anita Malibu S., Gr.1, 4th Keeneland Commonwealth S., Gr.2, Santa Anita Strub S., Gr.2. Sire. Captain Cherokee (Sir Cherokee). 4 wins from 6f to 8½f, US$361,845, Churchill Downs Allowance, 2d Santa Anita Palos Verdes S., Gr.2, San Carlos H., Gr.2, Potrero Grande H., Gr.2, Remington Park Sprint Cup, L, Mountaineer Park Harvey Arneault Memorial S., L, Churchill Downs Kelly's Landing S., L, 3d Saratoga Amsterdam S., Gr.2, 4th Oaklawn Park Rebel S., Gr.2.